Hey, guys! I was a special* guest on The Godzilla Podcast! We talked about Godzilla! I'll link the actual show when it gets posted. I want to thank Drew and Joe for putting on a great show about everyone's favorite King of Monsters, and deigning to have me appear with them to discuss the Big Guy! We talked about so much, and even then we didn't get into some amazing things like the Godzilla/Nagato theory, or the motivations behind why different movies were made the way they were. UPDATE: The podcast is now live at The Godzilla Podcast! I never really finished up talking about Godzilla fan culture, but I think now might be a good time. Not in this post, this is here just because I need to get a thought out. Both American and Japanese Godzilla fans mostly liked Shin Godzilla, while Godzilla Monster Planet has been much less well received. And I don't get it. I found Shin Godzilla to be dated, out-of-step, lazily-made, a bit boring, and overall an unpleasant to watch and ill-conceived movie. By comparison, Godzilla Monster Planet comes off as a riff on the Legendary Godzilla. While the setting is transplanted, the Monster Planet Godzilla is a natural force, albeit grander in scope. Humans set out to defeat the King of Destruction, and even in success, discover their efforts are futile. Humans are fighting a force that seemingly exists specifically because humans believe they are capable of defeating entropy itself. To me, that's a hell of a lot deeper than re-treading World War 2, or pollution. Godzilla has always been best when his raison d'etre is the hubris of mankind. That hubris can be tied to something specific *in the right context*; i.e. nuclear weapons tests in 1954 is topical and powerful, but making specific comments must be done with care. On a more nit-picky level, I really don't understand people who praise Shin Godzilla for having Godzilla be/do something new, then criticize Monster Planet for having Godzilla be/do something new. Or people who praised the Legendary Godzilla for making the story more personal to humans, then complain that Monster Planet centered on the humans too much. Stuff like that I really don't get. Anyway, I'll likely review Monster Planet episode 1 (yes, episode 1, supposedly) and contrast it with Shin Godzilla and Legendary Godzilla. While the Millennium Series Godzilla movies were winding down, featuring good special effects but very little new or interesting stories; several independent filmmakers took up the call of making Kaiju movies. Going through what each of these movies brought to the genre is unnecessary. The important thing to learn from all of these movies is that a lot of these filmmakers loved giant monster movies, and knew the state of modern special effects would allow them to depict all that was necessary for an effective monster movie. Because almost all of them understood that the missing piece in all of the poorly performing, barely adequate movies made on skimpy budgets was the story. The 90's Gamera movies had the luxury of tremendous FX mated to very good, if simple, stories. As I mentioned previously; they were as much (traditional) superhero movies as much as they were monster movies; the formula for such has been well understood since the first two Superman movies. Most of these movies functioned on two primary tenants: DON'T show the monster any more than you have too, and the people in the movie aren't out to watch the monster fight; they want to get AWAY from the monsters. Their story is about wanting to live, and accomplish their own goals. They aren't there as an excuse to show the monsters. There are, of course, problems with both of these simple guidelines, even as they form an excellent bedrock for structuring the individual elements of the film. When applied to a Godzilla movie, people come to the movie to SEE GODZILLA; they don't come to the movie to NOT SEE GODZILLA. The second rule, of course, plays into this as well. We need to see Godzilla on the screen. That's the important part. The people are secondary. If your monsters are anonymous space aliens taking over the Earth, it DOESN'T MATTER if you don't show the alien monsters very much. They're just the backdrop anyway; the important part is the people running away from them. This is the formula that launched the career of Gareth Edwards, the creator of the film Monsters, and the man tapped to make a second (published) attempt at an American Godzilla movie. Part Four: Legendary Godzilla (and Legendary Kong); Shin Godzilla; Godzilla Monster World. The actor who originally played Godzilla in 1954, and in many subsequent Godzilla movies, has passed away at the age of 88. Now is a good time to discuss Godzilla fandom. There are several ways to enjoy Godzilla films, and some fans insist on keeping these various cliques separate while others are more open-minded. The most common type of fan embraces everything Godzilla. The omni-fan tends to excuse the silly Godzilla movies as films for children, which is absolutely correct. They've usually read fairly extensively, although you tend to find a willingness to embrace apocryphal stories, and an insistence on clinging to bits of Godzilla folklore that have been disproven or explained. These fans tend to argue against any criticism from the angle that the end product is fine as long as you understand why the movie is the way it is. Equally common are the fans that embrace Godzilla as hero while dismissing all of his villainous turns after the original movie, and the fans who only take to the serious Godzilla movies and reject anything silly. These groups, while not technically opposed to each other, tend to find themselves arguing opposite points frequently. There is an increasing minority of fandom that analyzes each film according to it's own merit. These fans may or may not like the silly Godzilla movies, but they can still talk about the things that make those movies interesting or important. Same with the serious movies. Because even the cheapest and silliest movies are still products of the Japanese film industry, the sentiments, intentions, and practices used to create those movies are very different from the equivalent American film project. Only a few specific issues in the "bad" Godzilla movies was the product of an attitude like "We're just creating B-Movie trash. It's good enough." By the same token, some of the "good" Godzilla movies were produced with similar budgets, and frequently using the same casts and crews, as the "bad" movies. When a "bad" Godzilla movie is "bad", it mostly was NOT because the intent and effort were lacking, it was because the final product was made to be exactly what it was. It is worth noting that some of the silliest, most bizarre special effects of the Godzilla movies in the '60's and the '90's were the effects used to make Godzilla or another monster do something absolutely absurd. Showing Godzilla slowly trudge through Tokyo, using overcranking to give his movement the illusion of weight and immensity, is much easier to do having a sixty-year old man in a silicon suit with an eight foot tail do a flying bicycle kick. Stories are a bit different. Most of the '60's movies were written by Shinichi Sekizawa, who complained early on that he had no new ideas for monster movies. Which might explain why so many of these movies really do seem to be exactly the same. And even when different writers were brought in, the movies still invariably followed the same plot. But this mostly stemmed from directives by Toho studio heads, who considered Godzilla movies to be cheap, fast, reliable profits for children's movies. To be entirely honest, as even the Heisei Gamera movies demonstrated, there isn't a lot of leeway in establishing the basic outline of a Kaiju Eiga. When the third Gamera movie strayed from the tried and true path, the popular and critical reception wasn't quite as good. Interestingly, both the 2014 Legendary Godzilla and the 2016 Shin Godzilla actually do screw with the formula in different ways, and both movies find success doing so. As a counterpoint, the 1998 Devlin/Emmerich Godzilla mixed the structure of the original Godzilla with the sensibilities of a Michael Bay movie, and campy comedy of a bad English dub of a '60's Godzilla movie. When you look at it that way, it seems kind of obvious that the movie would never hold up. The point, in the end, is that the different components of the Godzilla fan community tend to seek out certain things in each new Godzilla movie: a lot of fans want Godzilla to be a hero; a lot of fans want Godzilla to be a villain or at least an opponent of man; some fans want an acknowledgement of the '60's camp, but probably a larger number (and increasing) want serious Godzilla movies. Note that being a quality production isn't really on the list. This is the context within which I'll look at the Legendary Godzilla and Shin Godzilla. I've been sitting on a review of Shin Gojira (Godzilla Resurgence) for a few weeks, now. Honestly, I haven't really wanted to write anything up, because on top of my criticism of the new Star Wars movies, anything I had to say about Shin Godzilla would inevitably come off sounding like "Get off my lawn!" 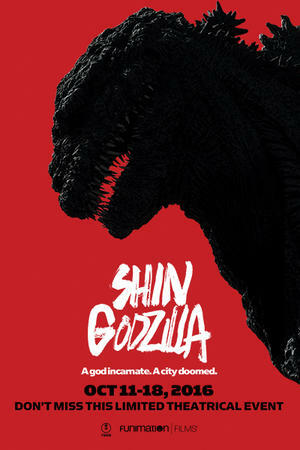 Because I didn't like Shin Gojira. Yeah. The movie that won seven Japan Academy Prizes. The screenplay that won Director/Writer Hideaki Anno a Best Screenwriter award from Kinema Junpo; Japan's oldest film magazine; which publishes annual lists that are considered as important as the Academy Prize if not more so. I didn't like it. In 1995, Daiei Film, the company that created the original Gamera movies during the giant monster craze started by the Godzilla sequels, rebooted the giant turtle series. Improbably. Impossibly. Nobody thought it would work. The creative force behind these movies where director Shusuke Kaneko, writer Kazunori Ito, and FX Director Shinji Higuchi. If you're an anime fan, you're probably familiar with Ito...he also wrote some Dirty Pair, the first and second Patlabor movies, and the original Ghost in the Shell movie, among others. If you are a fan of Godzilla, or monster movies in general, or Pacific Rim, or good anime for that matter, you owe it to yourself to see the three Gamera movies that comprise the Heisei Gamera Trilogy. I had not. Despite hearing for several years that these movies, largely ignored in the U.S., were some of the finish Kaiju movies ever made. In my defense, I had seen the original Gamera movies. I can sing "Gamera is full of meat!" with the best of them, as well. To me, they glorified and typified all of the things that made many of those 60's Godzilla movies cheap and laughable. I wasn't going to give Gamera re-imagined another try. I was wrong. I won't go into how I got started, but I had the opportunity to watch the first new Gamera movie, Gamera: Guardian of the Universe. In the four years leading up to 1995, Toho had released the following Godzilla movies: Godzilla vs. King Ghidorah, the 1993 Godzilla vs. Mothra, Godzilla vs. Mechagodzilla II, and Godzilla vs. SpaceGodzilla. While the 90's Godzilla movies featured updated special effects and better filmography, they had continued from the 60's camp movies with un-serious stories, physically bizarre fights, and highly repetitive plot points. While the final 90's Godzilla film, Godzilla vs. Destoroyah (the first film since the 1984 re-launch to take the subject seriously) was in production, Daiei Film was looking at Godzilla's dwindling success and planning a new Kaiju Eiga done right. It's almost amazing the degree to which Daiei Film succeeded. '60's Gamera is the friend of all children. '90's Gamera is, too. Surely they didn't spell it out nearly as explicitly as the early Gamera movies did, but the message is clear that Gamera has an affinity with children. '60's Gamera flies with something like rocket engines shooting out of it's shell. So does '90's Gamera. If you ever wanted to believe a giant turtle could fly, the new Gamera movies will make you believe. The new movies are definitely a bit more mature in tone and design, but it's a bit like comparing the original Superfriends cartoon to the Justice League cartoon of the 2000's. Throw out the camp, but embrace the spirit. Take it seriously. The result is astounding. The first movie is a fairly standard Kaiju movie done to modern sensibilities. Gamera's origin is vaguely established: the main characters hypothesize that the meaning of a prophetic marker that refers to Gamera indicates that Gamera was a "man"-made biological weapon built by...Atlanteans, maybe? Muu-ians? Some ancient civilization that played with powers they ought nought. The civilization created a weapon to use on it's enemies; the two-chromosomed, highly adaptable, nearly perfect species Gyaos. As Gyaos ravaged the Earth, the Whovians put all of their knowledge into creating a being to stop Gyaos, and project the Earth for all eternity. Ito and Kaneko manage to balance the story perfectly; plausibly creating a real-life setting in which a giant fighting turtle invented by ancient Atlanteans makes just enough sense to be acceptable. The second movie, Gamera 2: Attack of Legion, is probably about as good as a modern kaiju movie can get. Having said that, it's also done with a formula that works for Gamera but wouldn't work for almost any other monster. More on this in a minute. Gamera 2 has all of the beats of a kaiju movie, and like the first actually has the basic elements of horror that made the first Godzilla movie so effective. G2 also has all of the beats of a superhero movie. Unlike the Godzilla hero movies, Gamera and the Earthlings he protects can be hurt, even killed. While Godzilla gets knocked down, frequently gets knocked out; Gamera is pierced and bleeds. You actually feel sympathy for the monster hero, and fear the monster villain. If Legion isn't stopped, all life on Earth will end; because this is what Legion does. Lands on a planet, absorbs all life, and then explodes millions of copies of itself into space. It is here that Gamera truly becomes the defender of the Universe, as the entire Universe is at stake. The third movie suffers from having huge shoes to fill, and for some people because Kaneko pursued a different angle. The villain monster is at the same time the largest and most glorious creation of possibly any Kaiju movie ever, and at the same time the smallest and most personal. This movie isn't about the villain monster; it's about how people feel about Gamera. It's also built largely to bring closure to all the different storylines presented over the course of the three movies, make the film feel a bit forced at times. The intention was to close out a trilogy of movies while exploring a particular set of themes, and that's what was done...even the story doesn't necessarily lend itself to resolving these ideas. The FX are stunning; the fights are turned up to eleven, but contrasted against a more personal, somewhat rushed story, you feel almost as if maybe the director actually had two movie's worth of material crammed into one. Compare all of that to 1994's Godzilla vs. SpaceGodzilla; the campiest, silliest entry of the Heisei Godzilla series. The ongoing theme of the 90's Godzilla movies was Godzilla's DNA; and thanks to events from the previous movies, some of that DNA has made it into space, where it encountered some mysterious crystals and mutated into a super-Godzilla with crystals growing out of it's body. At least one scene of actual drama was cut to keep the tone more light-hearted. The new junior Godzilla, introduced in Godzilla vs. MechaGodzilla II, which actually looked like a juvenile Godzilla, was re-designed to more closely mimic the goofy "Minilla" design from the 1960's. Another staple of the 90's movies, a psychic that can communicate with Godzilla, is the human focus of the story. It's just silly. And none of it is treated seriously. Despite the improved FX, which don't hold a candle to the Gamera movies of the same era, the 90's Godzilla movies were treated like cartoons by Toho. That gets us to the 1998 Devlin/Emmerich Godzilla movie. The only thing important about it is that it prompted Toho to revitalize the Godzilla series yet again. 1999's Godzilla Millennium upped the ante in special effects, at least for Japanese films, and tried to adopt some of the mature tone of Kaneko's Gamera movies, the final film of which was just completing production. The final product is one of the better Godzilla efforts, with some truly excellent FX shots; but it still plays out like a light-hearted adventure. Seriousness is injected solely through lines of dialogue talking about how serious things are...we're never actually shown anything menacing. The follow-up film, Godzilla vs. Megaguirus, belongs firmly in line with the '90's films: shiny metal sci-fi miniatures, a cartoonish enemy monster, and a Godzilla fight that uses silly, out-of-place and unrealistic moves and actions. The major upgrade from the '90's movies is an increased active role for women in these solidly action-adventure movies. This set up the third Millennium series Godzilla movie. While Toho was actively considering ending the new movies after the disappointing performance and reception of Megaguirus, they remembered a director who had come to them in 1991 with a proposal for new Godzilla movies. Toho turned him down, and Shusuke Kaneko went on to re-invent the Kaiju Eiga with the Gamera trilogy. Now, with his Gamera movies completed, Toho turned to Kaneko for the next Godzilla movie. Godzilla, Mothra and King Ghidorah: Giant Monsters All Out Attack, despite an utterly preposterous title, went on to make over ten times it's budget; compared to the barely $1 million in profit returned by Megaguirus. As with the Gamera movies, people get hurt and killed. For the first time since the original movie (and Godzilla Raids Again, to a small extent), Godzilla is a true devil; a creature of evil mindlessly destroying the world. The Godzilla suit used for this movie is unique, with opaque, all white eyes and a furrowed, demonic countenance. The suit is more hunched over and bulkier, which helps remove the perpetual and obvious clue that there's a man inside a rubber suit. Godzilla kills just to kill; he targets humans intentionally. This is the only Godzilla film where the viewer feels that Godzilla is a threat to THEM specifically. While the public loved the film and demanded more, long-time Godzilla fans of the time were decidedly mixed over this movie. There was very little camp; only the design of Baragon, a half-dog/half-dinosaur-like creature with expressive eyes and floppy ears displays the cartoon-like-vibe that had been persistent for decades. Yet even that may have been an intentional move by Kaneko; as Baragon is little more than a doormat to the new Godzilla. Still, reports of studio tampering surround the film. Kaneko's vision for the movie was, allegedly, considerably more horrific and serious-minded. But Toho refused to bow to those demands. They were furious that Kaneko had turned Godzilla into an evil monster, and were uncomfortable with the scenes of death and destruction. While the good returns prompted them to ask Kaneko back to direct a second film, the demands they put on the planned production drove Kaneko from the project; and the Godzilla films returned to retreads of the '90's movies until the delightfully campy Final Wars in 2004. Flag from battleship Nagato, taken from the ship after it was manned by crew from Iowa, donated to National Park Service for Pearl Harbor. Pursuent to my personal pet-theory regarding the origins of Godzilla and at least some of the method to his madness, I recently became aware, while stuck in New Orleans thanks to a Southwest Airlines computer crash, that some Battleship Nagato artifacts were being displayed at the National World War 2 Museum on Magazine Street. Namely, some battleship binoculars with mounting, an officer's sword (likely but not definitely taken from Nagato), and the Admiral's flag placed there while the ship sailed as a flagship. Now I need art of Godzilla attacking the Big Easy, preferable with Nagato riding on his shoulders or head. No, not that one. BOC's Godzilla is a fun song, for sure; but it doesn't have that certain "edge" and Japanese freneticism that an ode to the King of the Monsters needs. This is the theme to the 70's 90's Television Show Godzilla Island. OK, I can't actually find the lyrics yet. I know what they ARE, I just don't have the patience to sit through the whole video and transcribe. The lyrics are the name of every monster that ever appeared in a Godzilla movie; all of which were featured on Godzilla Island. You can make out "Godzilla" repeated several times, "Mosura (Mothra)", Guigan, King Ghidora, Anguirus, Battra, Hedorah, Ebirah, Mecha Godzilla, Megalon, Moguera, Manda (lot's of M's), and even Supesu Godzilla (Space Godzilla). Yes, there was a Space Godzilla. I'll even tell you how if you want to know.